Hernando County Aquatics Department gently lowering artificial reef-balls into the Gulf of Mexico. Photo courtesy of Keith Kolasa. It’s been nearly eight months since Cole Kolasa paddled his kayak 788 miles along the west coast of Florida to raise money for reef conservation. He and his father, Hernando County Aquatics Service Manager Keith Kolasa, used the $3,200 they raised to purchase reef ball molds that would create concrete artificial reef structures along the west coast of Hernando County, Florida. 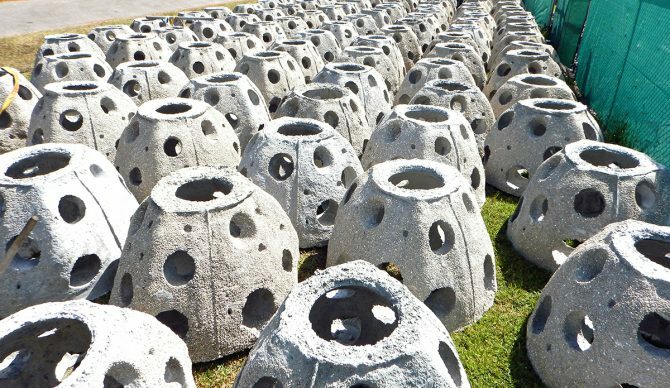 It was enough money to purchase four concrete molds of various sizes while the Hernando County Aquatics Department purchased an additional 128 prefabricated reef-balls to supplement Cole’s efforts. In September 2017, Boy Scout Troop 446, out of Spring Hill Florida, assisted in using the molds to build three reef balls of their own. That same month, Cole and Keith partnered with the SCUBAnauts, a teen marine science club, to begin the construction of the next four reef balls. After the SCUBAnauts filled the molds, they let the concrete cure for 24 hours. Once the balls were safe to move, Keith took on the task of carefully staging them alongside the other completed and purchased reef balls. Boy Scout Troop 446 filling the reef-ball molds purchased with funds raised by Cole Kolasa. Photo courtesy of Keith Kolasa. During construction, Keith worked tirelessly with the Army Corps of Engineers, National Oceanic and Atmospheric Administration (NOAA), National Marine Fisheries, Florida Department of Environmental Protection (FDEP), and the United States Coast Guard (USCG) to obtain the permits required for the safe deployment of the new artificial reefs. The permits mandated that measures be taken to protect the Gulf’s natural limestone outcroppings and fields of delicate sea grass. 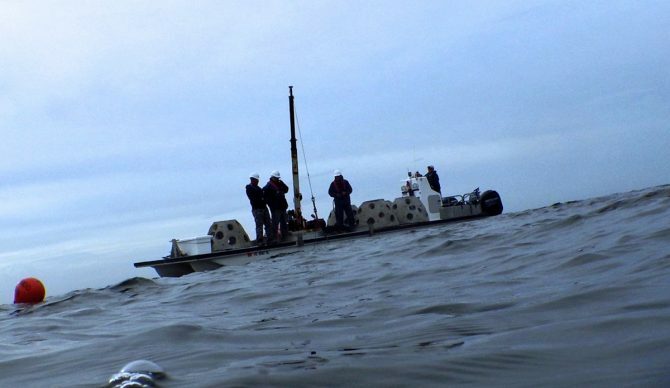 Additionally, the permits required that the reef-balls be at least 10 feet beneath the surface of the water; thus, ensuring that boaters and other sea-goers wouldn’t inadvertently hit the shallow structures. Keith’s determination to acquire the proper permits was influenced by the many stories of people who deployed unsafe reef structures, such as construction debris and old tires, which subsequently damaged fragile grass flats and disturbed the natural ocean floor. With permits in hand and approval for site placement, Keith and the Hernando County Aquatics team prepared to deploy the 135 reef balls. And on November 16, 2017, the team began their eight-day expedition to deploy 25 reef balls at site Alpha, 58 at Bravo, and 52 at Charlie. Each site was located between six and seven miles off Florida’s Gulf Coast, and as the last of the seven reef balls settled on the ocean floor, Cole and Keith realized their dream of shallow water reef conservation. Over the past two months, scuba divers, snorkelers, and fishing enthusiasts have visited the reefs to observe the abundant marine life that now calls the artificial reefs “home.” Keith says the greatest benefit of the reef is the potential for long-term environmental change within the shallow coastal waters. He also expects the reefs to improve the ecosystem almost immediately. The fish populations will recuperate due to the increased shelter for baitfish, which in turn will expand the foraging and spawning areas for larger fish like grouper, cobia, and sharks. Since the implantation of the reef balls, Keith and Cole have visited the sites multiple times and spotted a plethora of juvenile game fish. The Hernando County Aquatics team estimates the reefs will eventually host as many as 35-40 species of fish and eight species of coral. Keith says the SCUBAnaughts and the Hernando County Aquatics Department intend to conduct a series of formal assessments of the sites starting in April 2018, to gauge the success of the reefs and conduct official fish counts. Keith and Cole’s next undertaking will involve deploying additional artificial reef balls that will be dedicated to America’s veterans and the five branches of the United States Military. The purchase of the original four reef ball molds will enable them to invite community partners, youth groups, and wildlife advocates to participate in future plans. The reef ball molds will also drastically cut the costs for future endeavors because they can produce an infinite number of reef balls now, rather than purchasing pre-fabricated reef balls for each new project. If you or your organization are interested in participating or contributing to the shallow water reef-ball project, the Hernando County Aquatics Department would like to hear from you. Together, we can all make a difference.